That suit was dismissed in October of last year, but was refiled, including Ben Shapiro as another speaker for whom onerous protection fees were asked. The U.S. Department of Justice filed a “statement of interest” supporting the conservative plaintiffs, and, before the issue went to court, UCB agreed to settle the case. YAF and UC Berkeley also agreed to a “fee schedule” that treats all students, student groups, and speakers equally. 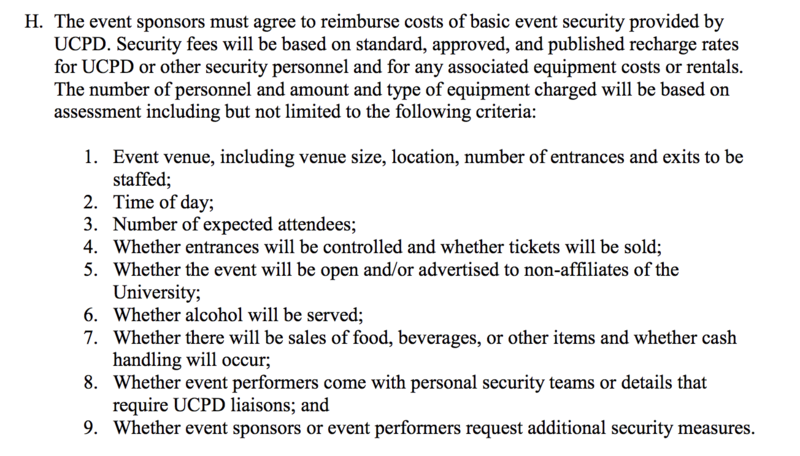 Unless students are handling money or serving alcohol at an event, there will not be a need for security fees. The “High-Profile Speaker Policy” was unwritten, but it was presumably UCB’s policy of raising security fees for “high profile” conservative speakers. It’s ironic that UCB, where the Free Speech Movement started, was fighting this issue from the outset. It’s clearly wrong, and probably unconstitutional, to charge student groups more when a controversial speaker is invited, especially when those speakers are almost invariably conservatives. Strict application of that policy would have the effect of eliminating conservative speakers from campus, simply because campus and city security couldn’t control the rampages of those on the left who insisted in violent protests and “deplatforming” unwanted speakers. This entry was written by whyevolutionistrue and posted on December 4, 2018 at 1:30 pm and filed under Colleges acting badly, First Amendment, freedom of expression, freedom of speech. Bookmark the permalink. Follow any comments here with the RSS feed for this post. Both comments and trackbacks are currently closed. You shouldn’t be surprised that the administration at UCB was concerned with restricting free speech; the Free Speech Movement was itself a resistance movement against UC President Clark Kerr and the University administration’s restrictions on student free speech. Speakin’ of Milo and money, I see he’s been busy bitching’n’moaning that he’s $2 million in the hole personally, and has been dunning his erstwhile patrons to kick in some more dough. I hate to engage in schadenfreude, but I can’t help myself with this one. I knew when he burst onto the scene that his success would only last so long. And the man regularly flaunted his rich lifestyle. I doubt he’s still eating at all those fancy restaurants and buying million dollar apartments now. Although, now that I’ve read the article, I’m not going to take it at face value. First, the line “Yiannopoulos owe[s] $1.6m to his own company” sounds like it could be very misleading in the context of saying he’s “$2 million in debt”; second, it seems the source of these documents is a rather sketchy one. Which conservative speakers do we consider worthy to speak at colleges? It doesn’t matter who “we” consider worthy to speak (whoever you think “we” might be). The point is that those people in college who do want to invite conservative speakers have the right to hear them without being penalised by punitive security costs, arising from the threat of violent disruption by leftist thugs. I was wondering if anyone would throw out names of political conservatives whose intelligence, integrity, etc., they admired. I’m afraid I don’t know of any, probably because I tend to rarely read conservative thought. I need to broaden my horizons and thought someone might make some suggestions. Or am I too off-topic? If you’re looking for a historical perspective on conservative thought, try Russell Kirk, especially his book The Conservative Mind. Or, hell, go back to responsible conservatism’s taproot itself — Edmund Burke. I don’t think uou are off topic. But I did not think you were making a serious request for names. I don’t kniw of any speakers, left or right ether than ex-office holders or candidates but don’t think that is what you are looking for. Some here have mentioned Never Trumpers like David Frum, Andrew Sullivan, and Max Boot. They are intelligent, informed, and very good writers. I wonder though whether they really should be called conservatives these days. Putting Max Boot and Ann Coulter in the same political category just isn’t right, IMHO. Max would surely object to being so enboxed. I think he does still refer to himself as a “conservative” though. Perhaps “nut” is a better category for Coulter and Milo. Yeah, sorry. I wasn’t clear. He would surely keep the original label and consider the others nuts. Which they are. Hell, Trump supporters too. Steve Bannon is an excellent speaker to have. No matter how odious I find his views, I think it’s important to hear a lot of what he has to say. It’s especially important given he was an (maybe one could say the) architect of one of the most surprisingly successful political campaigns in modern American history. That’s a person that I would want to hear from, not just to know about the campaign and what he did, but to know the arguments that lead him to his conclusions and that animate a surging political movement. Horowitz is one of those former Lefties turned right-wing of whom I dislike both versions. A LOT of these seem to come out of Berkeley. I’d say that an unreformed Trotskyist is far worse than a reformed one. The same goes for unreformed far-leftists of any stripe. They are all totalitarian mass-murderers-in-waiting. That’s like saying that all arch-conservatives are wannabe Fascists. There oughta be some kinda inverse-Godwin’s Law applicable here. Concur. But you have to agree with that first sentence. A Trotskyist turned conservative is a hell of a lot better than a Trotskyist. If there’s anybody can get behind such “voodoo economics,” it oughta be the GOP. I did not know speakers were charged for security. If they can do that, they should require speakers to post a bond to cover security and clean up. The argument that speakers should cover the codt should include the whole cost. Or the college should cover the whole cost. That us the method I would perfer.The security threat comes from the students, not the students. I don’t think you should charge the speakers to protect them from the students. That protection and clean up should be paid from funds from the students. The ones who create the problem and create the mess. Threat comes from the students, not the speakers. I believe that a fair number of the demonstrators, in particular the more violent of the demonstrators, at the Yiannopoulos non-event were not students but people who came to Berkeley specifically to protest. Who should pay for security and clean up? Like the right-wing nuts who travelled to Charlottesville. Good. It’s Berkeley’s responsibility to control their students and ensure they don’t riot/cause violence, not the student groups who invite a speaker that causes certain students to do so. The burden is on the college to maintain a safe environment, not on conservative student groups. Erudite conservatives who might be invited to speak at campuses, if the campus cultural climate were different: George Will, Heather MacDonald, Peter Hitchens, or Victor Davis Hanson. Thoughtful conservatives can also be found among writers for City Journal. Max Boot used to publish in Commentary mag, but Commentary has gone round the bend lately. There are tons of thoughtful conservatives out there. I think the people asking us to make lists of them are engaging in a worthless exercise (not that I’m implying any ill intent behind it. I just think it’s a fruitless endeavor). One person’s “thoughtful conservative” or “worthwhile Trump supporter” is another person’s hatemongering ideologue who isn’t worth hearing from at all. Bret Stephens (the NYT columnist (did I get the name right?)) is one. Also, if you want a current politician you might try some like Sen. Sasse of Nebraska. But there is a lot of chaff to separate from the wheat on the conservative side. Not that there aren’t a share of loonies on the left too. Here’s a fun exercise. Name five conservative comedians. Good point. There was one guy that was on SNL for like a minute but as he became more CONservative, became less funny. On the other hand, name even one ctrl-left comedian. Commitment to an ideology of answers that can’t be questioned, be it extreme left or right, militates against being funny. Much as the kinds of speakers the CONservative campus groups are repugnant to those of us who actually support Social Justice, the development is positive in that it incentivizes University administrators to crack down on the ctrl-left idiots who think that the heckler’s veto and even violence are a legitimate methods of countering abhorrent ideas rather than the tacit admission that you don’t have the intelligence or courage to refute those abhorrent ideas in a free and open marketplace of ideas.